36 km long boundary wall, over 360 temples inside the Fort complex, graceful Bengal caned marble columns, and delicate latticed balconies – Can anyone actually resist himself for visiting such an amazing place? After going through the Kumbhalgarh Travel Guide, I packed my bag and hired a taxi for such historically important destination. After a drive of 85 km from Udaipur, through the dense greens and fascinating valleys of the Aravallis, I finally reached Kumbhalgarh. The very first impression was marked to me by the entrance of the fort, which was as huge as I could ever imagine. While taking the entrance ticket, I hired a guide and headed for one of the most surprising sites I have ever seen. Suresh, the guide, told me that this 15th century structure is the second most important fort in Rajasthan after the Chittaurgarh Fort and boasts of being the birth place of the legendary King Maharana Pratap. Snuggled over 6,233 feet above sea level, the fort was built by Rana Kumbha. While peeping into the royal structures inside the fort, we paid short visits to the Salim Mahal, Jai Pol, Suraj Pol, Laxman Pol, Chand Pol, Kishan Pol and Andheri Gate. Badal Mahal is the highest place in the fort, built by Rana Fateh Singh in the late 19th century. I could actually feel the pleasant winds kissing my reflection on the pastel colored walls while I was gazing at the long serpentine lines of the fort walls and distant landscapes. 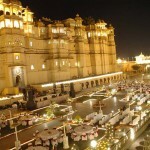 It offers the best of scenic view of the entire city and dense greens of the Kumbhalgarh Wildlife Sanctuary. The best view from such a high point was of the 36 km long boundary wall that boasts of being the second longest continuous wall in the world after the Great Wall of China. While having lunch at the restaurant at the entrance of the fort, Suresh told me that the entire fort comprises of about 365 temples. But as we were running short of time, I asked him to show me the most revered one. He took me to the Shiva Temple, which comprises a huge Shiva Linga (Phallic form). 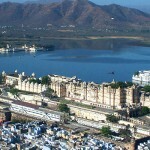 Jal Mahal, Nikumbh Mahal, Salim Sagar and Suraj Kund were equally beautiful structures. 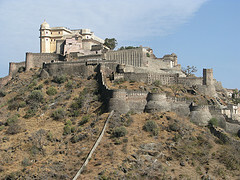 The fort, with 15 large and 51 small towers, offers splendid bird’s eye view of the surroundings. 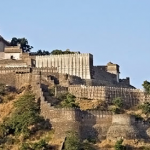 Kumbhalgarh Fort and its ruins, positioned in the midst of Aravalli ranges, were far more appealing than my imagination. «Next Post Ranthambhore National Park- Steeped In Royalty And Wilderness!